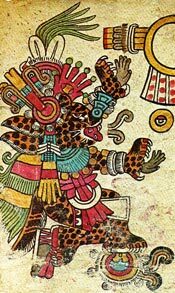 ... at the major international symposium on Tezcatlipoca in London (November 2005) a further characteristic symbol was brought to light: the ‘ezpitzal’, a puff, blast or ‘gust’ of blood. 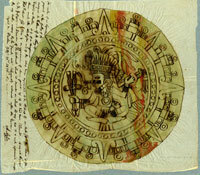 The ezpitzal is NOT present on the famous depiction of Tezcatlipoca in the Codex Borgia (see main picture above), but Professor Juan José Batalla (a member of our Panel of Experts and a world expert on the codices from central Mexico) has found 24 examples of the ezpitzal on Tezcatlipoca in a meticulous study of the Codex Borbonicus (now in Paris). 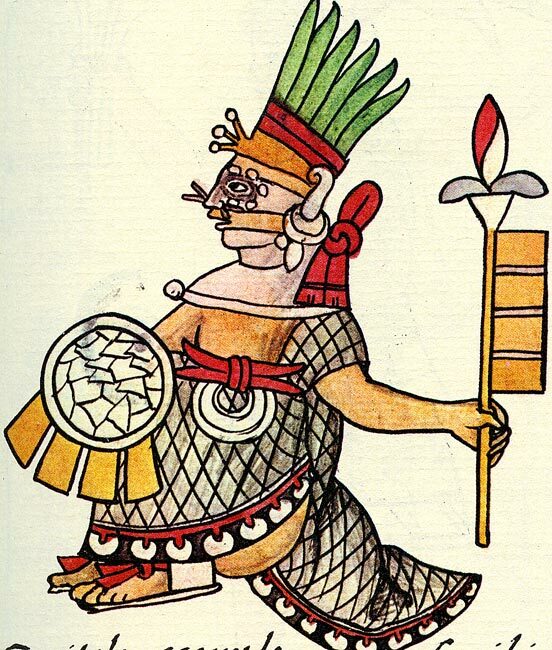 The Nahuatl word ‘ezpitzal’ comes from ‘eztli’ (blood) and ‘pitza’ (to blow or play [a flute]) - hence its translation (by such Nahuatl experts as Angel María Garibay and Miguel León-Portilla) as a ‘soplo de sangre’ (Spanish) or ‘gust of blood’. 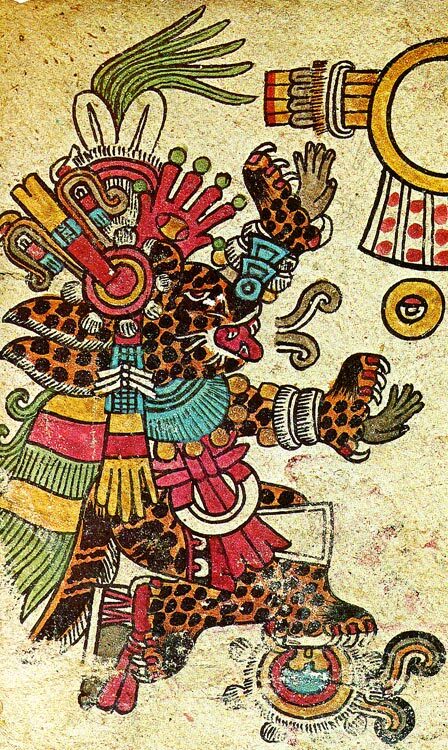 Professor Batalla pointed out that the term also relates to the Nahuatl concept of expressing anger (it’s worth remembering that Tezcatlipoca was a god notorious for sowing discord and deceit...). Salvador Matos Higuera calls the ezpitzal a ‘chalchiuhueztli’ (‘precious blood’ symbol). 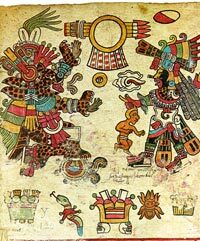 In the clearest example in the Codex Borbonicus (p.3) Tezcatlipoca is shown in the guise of Tepeyollotl or Tepeyolohtli (‘Heart of the Mountain’), possibly representing the voice of mountains and caves, that is, ‘echo’. 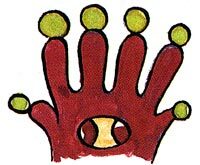 The ezpitzal can be clearly seen over the god’s head, with 6 mini-streams of ‘chalchihuatl’ or precious liquid (blood) - each ending in a precious stone - and a heart floating in the centre. 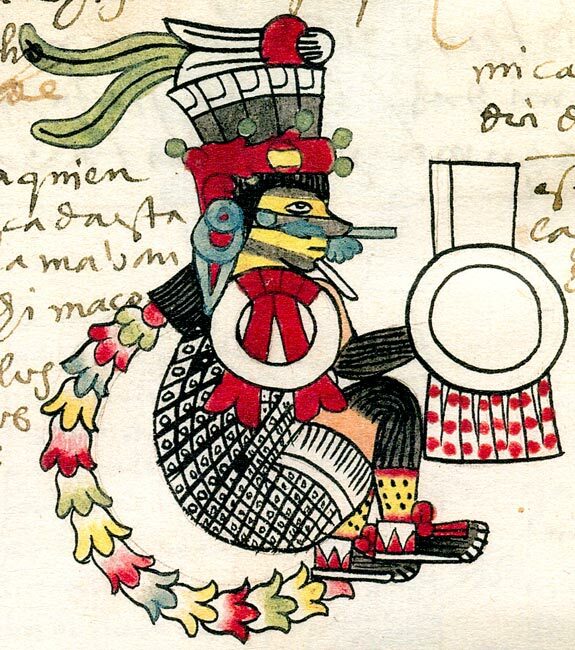 And in a different codex (Tudela) you should be able to make out the ezpitzal in the figure of Tezcatlipoca as patron deity of the ‘month’ of Tlaxochimaco-Miccailhuitl. 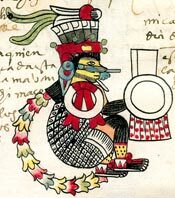 Though the Codex Tudela was drawn after the Conquest, the scribe seems to have kept faith with the pre-Hispanic tradition in depicting the ezpitzal. 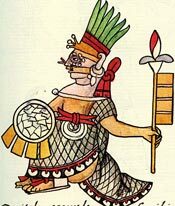 Look around the figure of Tepeyollotl and you should be able to recognise a smoking mirror (‘tezcatlipoca’) under one foot (and another, more stylised, on the head), and the circular pectoral (‘anáhuatl’) over the chest (made up of a white shell ring tied on by a red leather strap). And if you look further afield, round the whole scene (Tepeyollotl accompanies Quetzalcóatl on the right) you should spot two more heart symbols, and the ‘pinauiztli’ beetle described by Dr. Eleanor Wake in our Ask the Experts pages (follow link below). 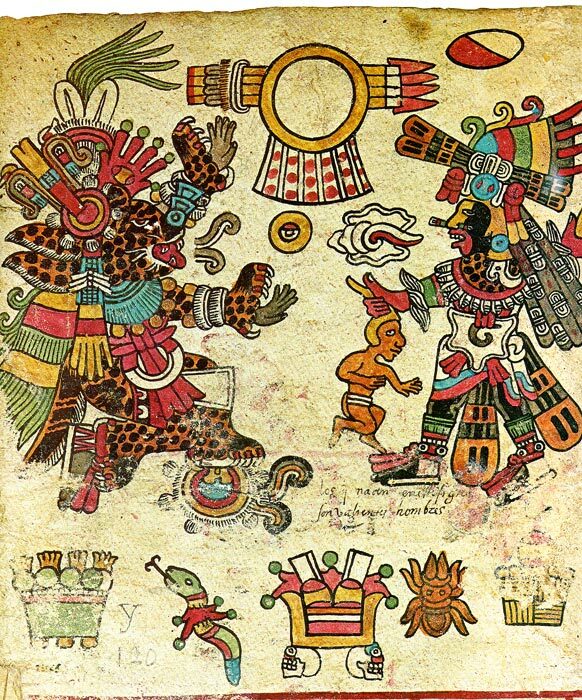 Find out more about the Tezcatlipoca symposium by following the link below.